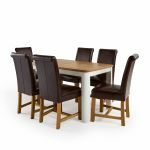 Brown leather braced scroll back chairs combine with Hove’s retro style table in this dining set. 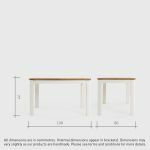 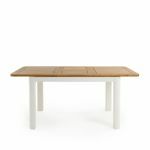 The Hove extending dining table has chalk white legs. 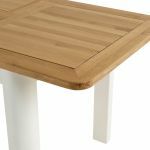 They’re painted hardwood that set off the beauty of the natural oak top. 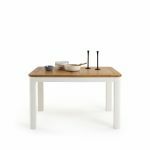 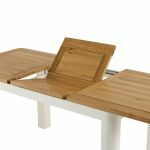 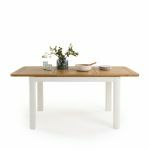 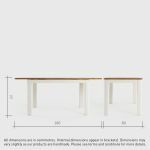 Unfussy in looks, with rounded corners, the table starts out at 4ft 3” (130cm), extending to 5ft 9” (180cm) with a simple mechanism. 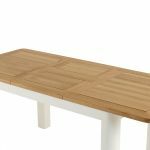 The chair legs have a natural oak finish which matches the table top. Braced for extra strength at the base, the brown leather upholstery is practical in the dining room. 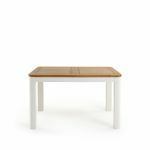 Buying a set of white dining table and chairs is a good way to get a great price for dining furniture, especially with delivery included. 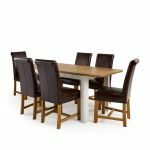 Remember that if this set isn’t quite right, you can fine-tune it to your taste with our Dining Set Builder, and still get a dining set price.